PARIS—Shortly following a transmission sent by the Mars Express spacecraft verifying that its instruments had detected a subglacial lake a mile below the planet’s surface, the European Space Agency confirmed Thursday that the orbiter’s surface-penetrating radar had disturbed the eternal and unspeakable dreaming of an aeons-old, world-ravaging malevolence, waking it from its 500-million-year slumber in the underground Martian reservoir. 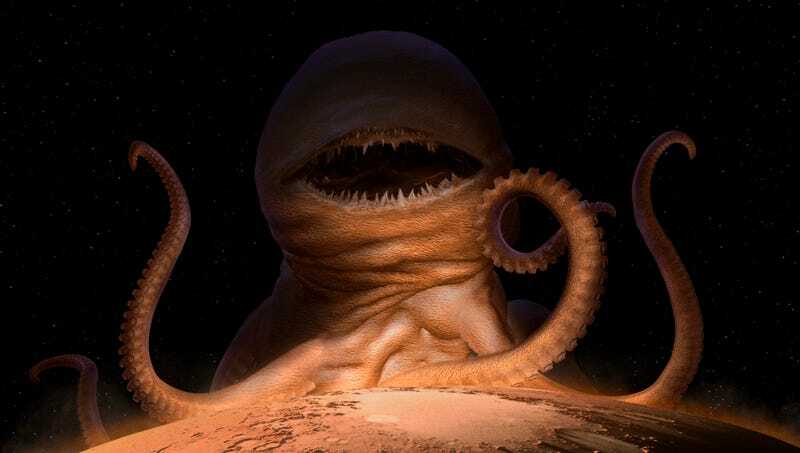 The abhorrent trans-dimensional beast then rose from the stygian depths of its lightless subaquatic lair, unleashing a hideous ululation that caused the red planet to fissure and burst into billions of molten fragments, an event recorded as a magnitude 18.5 quake by ESA scientists. The terror-struck astronauts of the International Space Station, evidently drained of their sanity by the sight of the accursed, star-spawned abomination, managed to inform ground control through increasingly incomprehensible transmissions that Earth’s moon had been devoured by the ravening behemoth before all communication with the crew was cut off suddenly and completely. ESA administrators, initially optimistic about the discovery of liquid water on Mars and its positive implications for future colonization, changed their message to one of warning earlier today, shrieking barely comprehensible messages of doom as they clawed their living eyes from their sockets in a vain effort to escape contemplation of the vast horror descending upon the world at this very moment to drink our insignificant lives as it will one day drink the light of the stars.